An autonomous transaction is an independent transaction to the main or parent transaction. 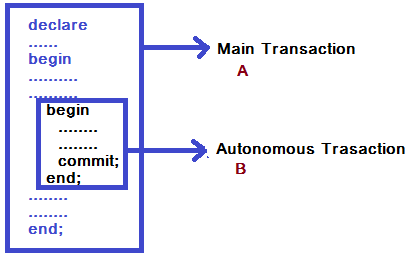 If an Autonomous transaction is started by another transaction it is not nested, but independent of parent transaction. Assume A is not completed because some unhandled exception occurred after B and B will be successful since it is an autonomous transaction. There are many situations you can use autonomous transactions but I would say error or event logging and auditing are the classic examples. Even though pl/sql got error Autonomous Transaction procedure logged the error. a) Autonomous Transaction with delete or update command. They must be used very cautiously and use it only if you know exactly how transaction works in Oracle. We can also call a different procedure for error logging which will have a commit. Why do we really need to use pragma autonomous transaction.